The museum is spread over three floors. On the first or ground floor is the shop and the museum part, which has exhibits about ramen. The fun part though exists on the two basement floors. It's best to go down there by the elevator. You enter it from a boring office lobby in the 21st century, and exit to this. A slightly seedy night time scene around a train station from sometime in the past has been recreated. It's a bit like the Forum at Caesar's Palace, or the Venetian's fantasy version of Venice, except that it's 1950's or '60s urban Japan rather than ancient Rome and so on. It might help to have some cultural background here. The post-war Showa era (the Showa era was the reign of the Emperor Hirohito as he's known outside of Japan) is regarded through rose-colored glasses with lots of fond nostalgia in Japan. It's kind of like the nostalgia in the U.S. for the Mad Men period of the early '60s, not to mention "mid-century modern" stuff in general, except that it's lasted a lot longer and is arguably more emotional. Japan of the late '50s to '60s was booming economically, yet many people still lived in small, friendly neighborhoods, children took care of their parents in their old age and kids grew up with their grandparents, and all that kind of thing. At least that's the perception. Things from the Showa era (often called Showa Retro (昭和レトロ) have been 'in' for some time now. The world created in the basement of the Shin Yokohama Raumen Museum attempts to bring back the look and feel of those good old days. The train station neighborhood setting makes sense, since small ramen restaurants used to, and still do, like to set up shop near a train station to catch commuters passing through. There are 9 ramen shops dotted around Tsurukame-cho, Renge-cho and Naruto-cho, the three mythical towns of this neighborhood. 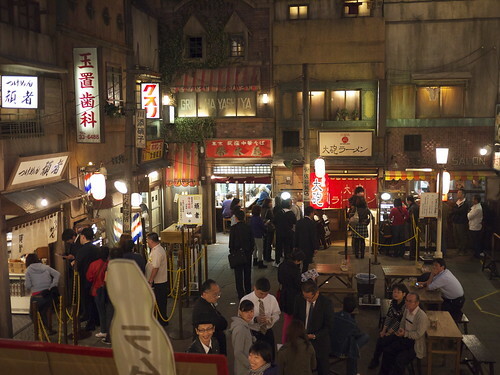 The shops themselves are operated by actual famous ramen restaurants from around the country. Ramen is basically noodles in a rich broth. There are, or used to be, strong regional preferences for one type of broth or another. 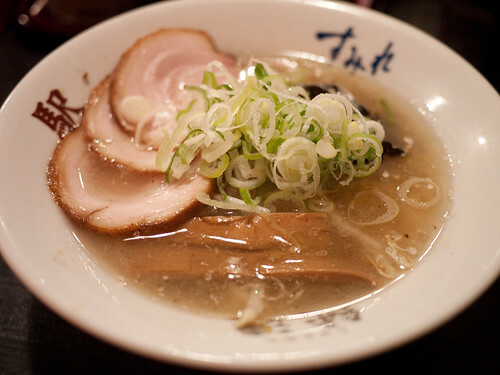 In the southern part of Japan, namely Kyushu, pork bone (tonkotsu) broth is favored. In the north, especially Hokkaido, clear chicken and vegetable based broth flavored with salt and often with some butter added is predominant. There are personal preferences too; some people prefer a soy sauce based soup, some like a miso base, some a salt-flavored base. Finally, in fairly recent times spicy flavors influenced by Korean and Thai noodle soups have come into vogue too. Then there are different things that can be added to the ramen, such as wonton dumplings, char siu (roast pork), menma (dried bamboo shoots) and so on. At the Raumen (Ramen) museum you can experience representative samples of all these types of ramen. Incidentally, this is how things work at the Raumen (Ramen) Museum ramen restaurants. In front of each store there are two lines. The one on the right leads to the shokken (食券) or "food ticket" vending machine. You insert money there and press the appropriate buttons to choose your ramen type, and retrieve the little ticket that the machine dispenses. Once you have your tickets in hand, you get into the line on the left, which leads into the store. You hand the tickets to the shop assistant at the entrance as she shows or points you to your seats. On my most recent visit with my sister, we decided to try three different types of ramen. We went with the "mini" servings, which are about 2/3rds portions, so that we would have room for all three. First up: tsukemen from Ganja in Kawagoe, Saitama prefecture. 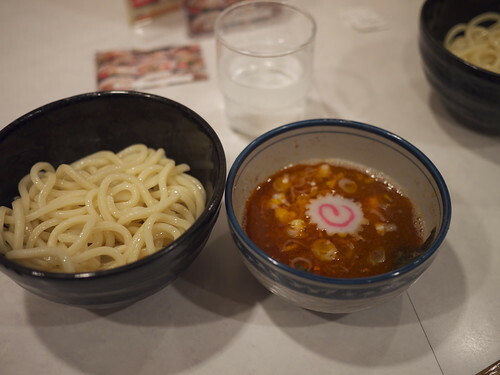 Tsukemen is actually the most un-ramen like ramen they have at the Raumen (Ramen) Museum; instead of noodles that are already in soup, tsukemen noodles are dipped (or tsukeru (つける））into a separate bowl of rich broth. The noodles at Ganja are very thick, rather chewy, and white rather than the characteristic yellow of most ramen noodles. I wonder if they got the idea from local udon noodles. My mother's side of the family is from Saitama, and my aunt (who grew up in a village in the hilly Chichibu area) makes great thick, chewy udon noodles by hand. We sat at the counter alongside several guys and a couple of girls who looked like they had just dropped in from the neighborhood. I had the spicy (gekikara) broth, while my sister had the non-spicy broth - mini-size of course. Both were rich and good. You can pick up a 'ramen passport' at any of the shops, to collect stamps in if you wish. Next up: some tonkotsu (pork bone) broth ramen from southern Japan - Taihou Ramen in Kurume, Fukuoka prefecture. We sat at the counter again, with a good view of the guys working behind it. Their mini-ramen looked just as impressive as their regular sized ramen. I love eggs in ramen and always wonder how they manage to get it perfectly soft on the inside. The broth was indeed rich and thick, but I can't say I liked it much - it had an odd fishy undertone, even though their literature says they only use pork bones to make their broth. 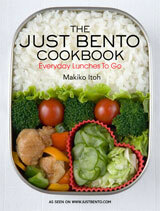 I rather suspect they use some iwashi (dried sardines) too. 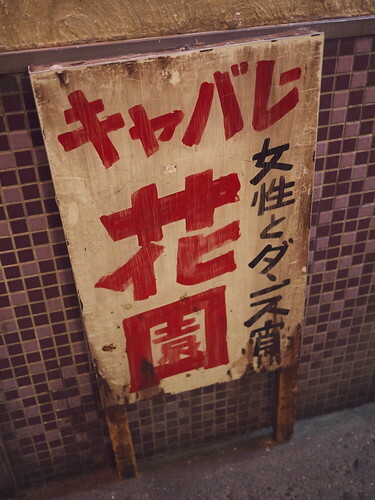 The noodles were the bou (棒) or straight stick type, rather than the characteristic crinkly type. Our final stop was at Eki or Sumire, hailing from Sapporo, which is located in Hokkaido - up north in other words. 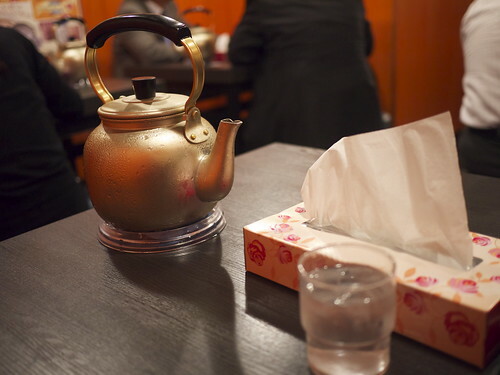 I loved the old style homey touches they had here, like the tin kettle for the ice water and the box of tissues on the table instead of paper napkins. I have always been partial to Sapporo style ramen, and Eki's was my favorite ramen of the three I tried. I had the shio ramen, with a clear broth flavored with salt. It had BP-worthy oil slick (lard with a touch of sesame oil I think) on the broth, but otherwise was perfectly flavored - rich and assertive but not cloying. The noodles were the crinkly, slightly yellow, slippery type that I like. The char siu was not bad either. My sister had the miso ramen, and agreed with me that Eki was her favorite too. Of course ramen preferences are a very individual thing, so you may disagree with us totally. You just have to try for yourself. Our bellies full of broth and noodles, we waddled around the "night time" streets a bit. They are pretty well done actually, with lots of detail. Here's a fake storefront for a real estate agency, with ads for rooms renting out for three thousand yen and up. This is a store sign for the Flower Garden Cabaret, which proclaims that you can "dance with women" here. 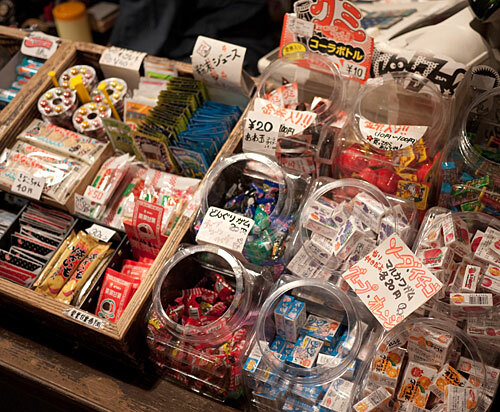 On the upper or B1 level, down a back alley, is a dagashi (駄菓子) shop. On the official web site this translated as a "dime shop", but what it really is a penny candy shop (or in British terms, a sweet shop). 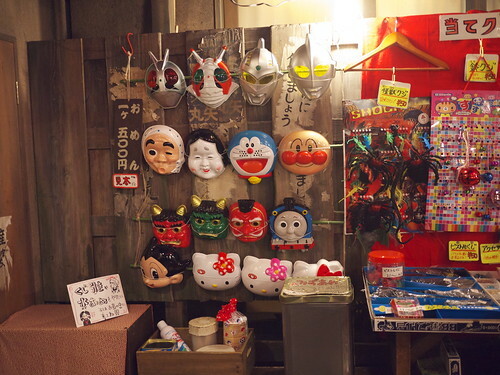 Here you can purchase real candies, old time toys and other things, such as "bromides" (pinup photos) of bygone era celebrities. You grab one of the plastic baskets piled up outside the shop and fill it up. There's plenty more to see in the nighttime streets, though it helps if you have a Japanese person along with you, or can read Japanese. It also helps if you know something of the era they're depicting. For more photos, see my flickr set. The Shin Yokohama Raumen (Ramen) Museum just happens to be within walking distance of my base in Japan (my mom's apartment). Is it worth a detour from central Tokyo or elsewhere? Well, it is a lot of fun, but I suspect it's more fun for Japanese people or people who are thoroughly conversant with fairly recent Japanese history. As for street scenes they have recreated here, although the details are from the past, you can still find neighborhoods similar to it in real life around Japan, even in the Tokyo area (the train station nearest to my mom's is kind of like that actually, with the addition of several conbini and fast food joints). You can find plenty of little independent ramen shops to visit without having to go to the museum. 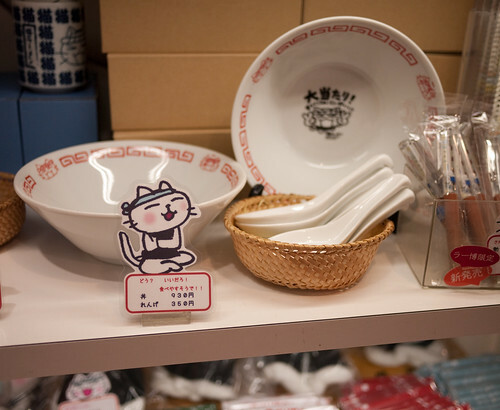 The museum is a great way to experience all kinds of ramen in one convenient place though, and to and learn a bit about its history and such. If you're coming to Yokohama for the day, I would suggest combining a trip to the museum with a trip to the very real and vibrant Chinatown and Motomachi area in Yokohama, which I'll post about eventually, or the beautiful Sankei-en. Or go over to Yokohama station (not to be confused with Shin Yokohama) for some serious shopping at Takashimaya, Sogo (which has a Loft and Muji inside), Lumine, Tokyuu Hands and more. The official web site for the museum has all the information you need, including great directions for getting there from Shin Yokohama station. There's also a 50 yen off admission coupon you can print out there. Regular 1 day admission is 300 yen, a 3 month pass is 500 yen, and an annual pass is 800 yen. That doesn't include the cost of eating anything inside. Regular bowls of ramen are around 800-1200 yen, and mini ramens are 500-750 yen. You should probably allow at least 2 to 3 hours to eat ramen and explore the museum, more if you go on a busy weekend or during a holiday period (avoid school vacation time and Golden Week). Should you still be hungry after the museum, Shin Yokohama station itself has tons of restaurants, a small branch of Takashimaya with a food hall, plus several independent takeout places, including a Kiyoken store right opposite the Shinkansen entrance. Kiyoken is a Yokohama institution, and I am very partial to their shuumai dumplings. Submitted by maki on 2010-11-02 05:44. Thanks for this! I've had it bookmarked for ages, but this is the nicest English writeup I've seen of it. :) I'm looking forward to going there and the Gyoza Stadium or whatever it is if I ever get a chance. I'm definitely going to go next time I'm in the Yokohama area!! In southern Kyushu, pork bone broth is favored. In northern Sapporo, clear chicken and vegetable based broth flavored with salt and often with some butter added is predominant. The way you wrote it makes it sound like tonkotsu ramen is only available in Kagoshima and Miyazaki, when obviously it's all over Kyushu. Same with the Sapporo thing, it sounds like it's only in the north of the city. If you just changed it to Kyushu in Southern Japan etc it would be much clearer!! I ate at the Taihou place the other day in Fukuoka city, and Although it's my boyfriend's favourite, I didn't care for it that much either. 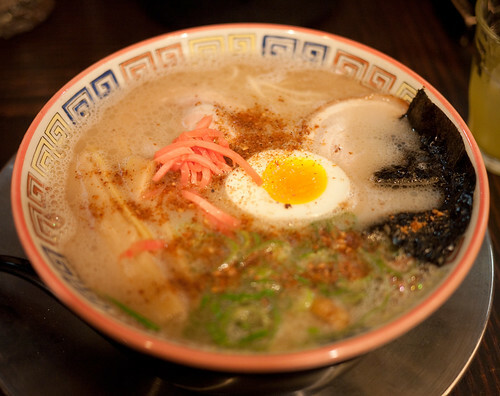 I do love Tonkotsu ramen though, I think it would be a waste to live in Fukuoka and hate it!! Darn! You've reminded me of a place I'd wanted to visit for years but forgot to before I left Japan. Throughout my high school years I was a Ramen-phile, and it wasn't the wonderful meal-in-a-bowl that the authentic ramen experience brings. 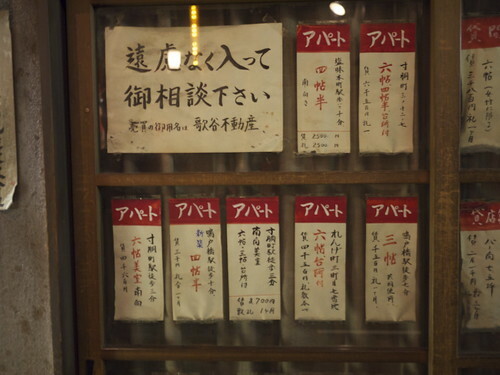 (It was cup ramen or maruchan >.>) When I learned of the ramen museum in Yokohama I was determined to go some day. Ironically enough while it has the reputation of being the quintessential poor college student food, I stopped eating it while in my university days, probably in an attempt to be healthy. While I have since learned the magic of a good bowl of ramen, even in Japan it was an occasional treat. Still I'm sad that I missed it, but thanks for the account! Next time I go back I'll definitely check it out. and for those of you who still want to visit ramen-land but are stuck in Tokyo, I highly recommend visiting Takadanobaba/Waseda. 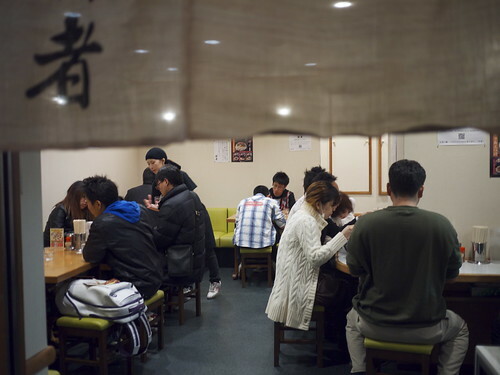 There are over 50 ramen places between the Yamanote Takadanobaba station and Waseda's campus! I love the Chichibu area! It's such a lovely area, and you can get such wonderful soba and udon. When I lived in Saitama-ken, we went out to Chichibu several times. Still haven't made it to the ramen museum, really want to go though. I can see where one would come out of the place utter stuffed, and so salted that you'll practically be a walking salt lick. And I need that Neko ramen merchandise! So cool! The ramen museum is well worth a trip from Tokyo even for non-Japanese speakers or history buffs just for the ramen! Especially if you aren't traveling all over Japan the museum is a great place to try all of the regional ramens. Yum. My wife saw this piece and forwarded the link to me. The article filled me with nostalgia. We lived on the Kanto Plains when I was in the U.S. Navy from late 1968 to the end of 1971 and I used to occasionally hit the ramen stand just outside Tsuruma station when I got off the train and caught the bus to the base where I was assigned. We have a tiny miniature of a "shina soba" cart that we picked up while we were in Japan. Natsukashiiiii! I grew up in Toyama and Tokyo during the years that Showa Retro now harks back to. Ohh, those signs, so nostalgic. I looove ramen, and nihon-soba probably a little more. I would so go to this museum the next time I visit Japan. Trouble is, I want to eat everything. Reminds me of the time I went to Kyoto. While waiting to tour the old Imperial Palace, I discovered a little gyoza-tei outside the gate, a mom and pop four seater. They were assembling the day's gyoza. Of course we had to have some when they opened. We also had planned to eat lunch at a renowned soba place. After the gyoza and soba, we had to go to a fresh tofu restaurant. Then, on to some miso tasting, some of which I smuggled back into the US. Okay, I'll stop now. But I sure do enjoy your blog - it makes me hungry! Thanks so much for this post! I was looking for nabe recipes and saw this post during my search! I love Yokohama! I lived in the lovely neighborhood of Kikuna for a year as a JET. It brings back lovely memories totally natsukashii. I had the luxury of walking to the Ramen Museum when I was there. Just wondering, is it raumen or raamen? I learned that " ー " of ラーメン was an " a " like for party, "paati" ? It is a great place to visit especially for ramen fans! Please post more about Yokohama, especially the Minato Mirai area! Looking forward to your stories! It's pronounced 'raamen' with a long aa, but for some reason the museum writes it as 'raumen' in their name, though on their website they say 'ramen' most of the time. Confusing! Thank you so much for this fantastic tour of the Ramen Museum! I felt like I was able to come with you. I have been dreaming of visiting Japan for years and I felt like I just went on a mini-vacation. This was truly a well written, well photographed, wonderful experience that you shared with us. Thank you! I've been planning my very own foodies tour of Japan for almost a year now and this is one of the top places I really want to go to. Great write-up! I was going to ask Maki to add it to her Google map then I checked and 'yes!' she has already listed it. I visited a few years ago while in Japan for a month visiting my wife's family. 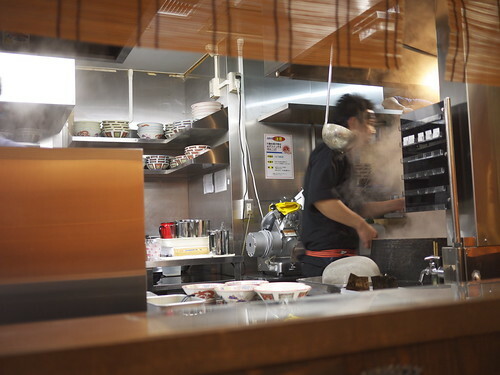 I ate Ramen at a different shop every day and blogged about it. I blogged about some other food as well. Of course, I am not Japanese, so forgive me if some of my interpretation is incorrect. I sampled and wrote up three ramen at the museum. Ahh I went there in 2005 with my sister. I had a great time, we even filmed our visit. I couldn't read any Japanese back then so I guessed which button I had to push. The first time I was lucky I actually got the mini sized portion, but in another store then I picked the normal portion. Gosh I was stuffed but finished everything. I visited the museum just four days ago (still a week to go of my Japan vacation) and while the ramen is great, the museum is largely a waste of time if you don't speak Japanese. The only thing in English is a pamphlet briefly describing the nine ramen restaurants. Nothing else. But if you're in the neighborhood, or travelling west with a Japan Rail Pass, it's a great place to try some types of ramen you might not have eaten before. I just saw an American/Japanese movie called "The Ramen Girl" with Brittany Murphy, and there was a scene filmed here. Now, I will have to visit. It's the first time I've visited your blog and I am seriously impressed by not only your writing, but the beautiful photos. Well done. It looks like a ramen version of the Gyoza Stadium in the indoor Namjatown theme park in Ikebukuro: there're a dozen gyoza stands in a Showa town. I think the raumen one opened first though. 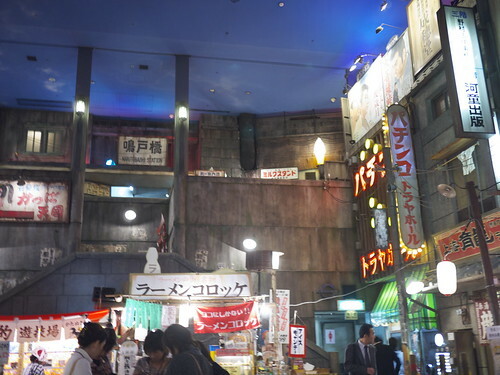 There's also a Showa town in Odaiba on the upper floor of one of the shopping centers, although it's not food centered. which I though odd, given that we were invaders in a foreign country. I have long thought of a trip to Japan, and luckily I have a Japanese born friend, who would accompany me, however, even though she goes on yearly trips there to visit relatives she confesses her language skill are lacking and her Grandmother says she speaks more English than Japanese. How do you think we would do, with one pseudo-native speaker, and one that speaks a middling of phrases and cannot read a word of Japanese? Hi Melissa, first re: postwar Japan and the US military forces stationed there. From what I have read, and also what I've heard from my father and so on, in general the Americans and the Japanese got along quite well for several reasons. First, most of the population was just so relieved the war was over, there was more food, etc etc. Also (probably under strict orders from above) the GIs stationed in Japan were very friendly and polite towards the 'natives'. Unfortunately that ethos sort of changed in recent years in some areas where US military bases are still stationed, which has led to problems (e.g. in Okinawa)....but in your grandfather's time, things were a lot more amicable. As for your trip to Japan, go for it! You'll be absolutely fine and have a blast ^_^ Most signage nowadays is in Roma-ji (written out in ABC), there are more English announcements, signage, etc. Out in the countryside you may encounter a few problems but nothing you won't be able to figure out eventually (besides, people out in the countryside are a bit more friendly anyway, as in any country). 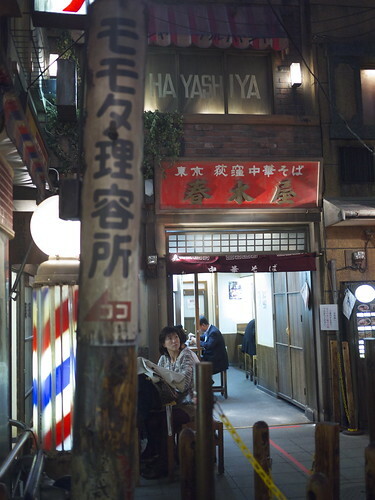 I've enjoyed a lot of excellent, delicious ramen in Japan, but the best I'ver ever had, surprisingly, was at the Shin Yokohama Raumen Museum, on a visit back in 2006. The museum was great deal of fun, besides wonderful ramen, and I'm glad to hear that it's still doing well.